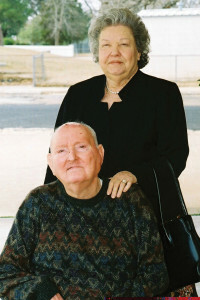 Carlos Murphy and his wife Pat. An old proverb says, “Into every life a little rain must fall.” Carlos Murphy of Pasadena was deluged. In 1988, Carlos was felled by two massive strokes. He was left a quadriplegic, able to move only his head and talk in a whisper. Until then, he had been a whirlwind of vitality—a husband, father, grandfather, and pastor. For more than 20 years, Carlos had ministered to the needs of others, encouraging them to hold on, to not give up, to keep on believing, to rise above their storm. Suddenly, God asked him to walk out what he had been preaching. Life came to a screeching halt. Gone was the nice parsonage home on a golf course. Gone was the loving congregation that delighted a pastor’s heart. Gone were the bank account and every aspiration for the future. The change came with no warning and without remedy. When his thoughts cleared in a hospital room months later, only two things remained: an unshakable faith in God and a wife that never quit praying. To be sure, his faith was tested. To be sure, prayer rang hollow at times. Faith wilted like a flower in July heat, but even in the dark dungeon of a lifeless body, its root remained. After a year of continual crying, sinking beyond reach in the quagmire of depression, Carlos touched solid rock. He took inventory and realized that, though he had lost every material and physical comfort, he had not been completely snuffed out. “Through the Lord’s mercies we are not consumed,” Isaiah wrote, “because His compassions fail not” (Lam. 3:22). Then came a turning point, a defining moment, a door only God could open. A niece encouraged Carlos to write a column for the religion page of the Deer Park Broadcaster. A helper took dictation, and the lessons stored away untold in the recesses of a man’s heart found new voice. Out poured a message of encouragement and resolve, expressed by a man who had walked in solitude with God. Faith forged in secret came into the light. People responded. With wife Pat at his side and a helper named Rosa penning his whispers, Carlos wrote his weekly column for more than a decade. He did write a book. 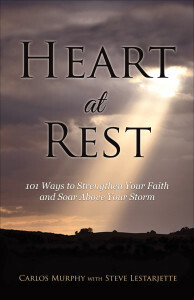 Working together, we compiled his newspaper clippings into a compelling devotional called Heart at Rest: 101 Ways to Strengthen Your Faith and Soar above Your Storm, and published a small number for the church we attended together at the time.